ILIGAN CITY Dart players from Cagayan de Oro and Iligan harvested the championship titles and most of the runner-up honors in the classified three-man team and doubles of the Mayors Cup Open Dart Tournament at the Vox Grill here last November 14, this year. Beginners Sante Coleto and Melser Mamaran of the host Association of Iligan Darters (AID) and Cagayan de Oros Rex Jilhanney ruled the three-man team category for a championship trophy each and shared the P6,000 top prize. Tournament coordinator and AID president Jeffrey Job Abrazado said the performance of Coleto and Mamaran was a surprise to them since both are newcomers to the dart circle. The former is a city government employee while the latter is a construction worker. Jilhanney, on the other hand, is with a messengerial firm LBC. In classified doubles, Cagayan de Oros Abet Sarmiento, teamed up with Pagadians bet Pating Burias, romped off with the championship titles and shared the P4,000 purse. Golden Friendship Dart Club (GFDC) vice president Daniel Quilinguing said that Cagayan de Oro virtually emerged as the overall champion since 10 of its players made it to the winning circle while Iligan only had eight. 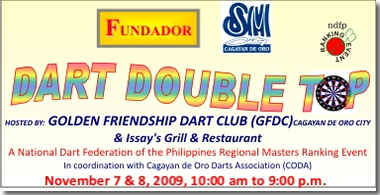 Cagayan de Oro was represented by the members of GFDC and Bugo Warriors Dart Club. Other runner-up winners, in both categories in the one-day tournament that was participated in by 145 players, were darters either from Cagayan de Oro or Iligan. Other players were from Lanao del Norte, Lanao del Sur and Misamis Oriental. All of them underwent through double elimination rounds, 701 best of three in classified three-man and 501 best of 3 in classified doubles. Three-man team first runner-up winners were Zaldo Velez of Cagayan de Oro together with Iligans Eric Pearanda and Dandy Embornas while the second runner-up honors were wrested by Jun Intong of Iligan, teamed up with Cagayan de Oros Rene Tapao and Roy Megria. The third runner-up spot was all Cagayan de Oro with Michael Buscio, Weng Soriano and 17-year old JC Amaba, all Bugo Warriors dart club members. In classified doubles, all runner-up tandems were composed of Cagayan de Oro and Iligan players: Eric Pearanda of Iligan with Eric Ranario of Cagayan de Oro took the first runner-up; National Dart Federation ranking player Nathaniel Guba of Iligan and neophyte Jonathan Panillon of Cagayan de Oros GFDC settled for the second runner-up; while Cagayan de Oros Dennis Carpentero and three-man team champion Coleto of Iligan salvaged the third runner-up spot. AIDs Abrazado, together with vice presidents Zaldy Cabiling and Benny Poncardas, were thankful to Iligan City Mayor Lawrence LL. Cruz for sponsoring the tournament that offered trophies to the champions and first runner-up winners and P20,000 total cash prizes.